© 2013 Distributed by bitComposer Entertainment AG. bitComposer Games is a brand of bitComposer Entertainment AG. © 2013 Developed by Logic Artists ApS. 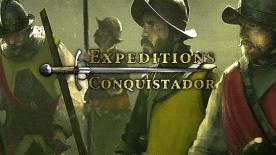 Expeditions: Conquistador is a registered trademark of Expeditions ApS.